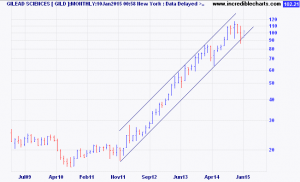 Gilead Sciences (GILD) is a leading biotech company with a great product pipeline and impressive free cash flow. Like Avago, Gilead is very nimble for its market cap of $154.02 billion. 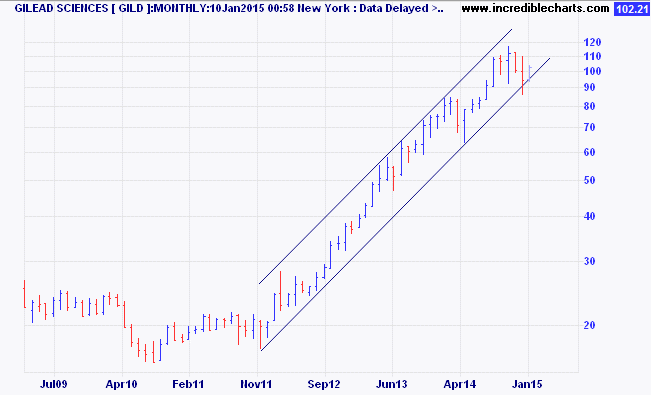 GILD has a price to earnings (P/E) ratio of only 18 and price to earnings growth ratio of just .49. This ratio means that the stock is selling at almost half of of its earnings growth which should give it more upside at the current price. As can be seen by the chart below, the stock has been moving steadily up since late 2011. Just recently, the biggest provider of health coverage to U.S. businesses chose Gilead’s Hepatitis C drug as the primary option for its patients with the most common type of Hepatitis C over a rival. In fact, Gilead has established itself as a clear leader in treating this disease while making billions of dollars in the process in 2014. The Shooting Stars Portfolio is buying 75 shares of GILD at $102.21.